Am I a mean, intimidating person? Perhaps I'm going to be sorry I asked this question. But seriously, I'm starting to wonder what people think of me. A few weeks ago, my girlfriend told me that there was a miscommunication between her and her husband which resulted in him booking a business trip on the same weekend as my wedding. Of course I was totally bummed when she told me, but I didn't flip out or anything. So I was a little surprised but really didn't think too much of it when I called my girlfriend and her hubby picked up and had a certain reaction to me. The moment he heard my voice, he said something like "Oh boy, I am fully prepared to bear the wrath and read about how you're going to tear me apart on your blog for scheduling something on your wedding day and I fully accept it. I messed up. I'm so sorry. yada yada yada." Like I said, didn't give it much thought. And then another incident happens. I asked my friend who I'll affectionately nickname "Fro-Yo" to come to a wedding planning meeting with me. Granted 1)I did give Fro-Yo plenty of notice so he could clear his calendar 2)Fro-Yo confirmed with me the week of the appointment that he was going to make it and 3)I emailed Fro-Yo the day prior to the meeting saying "I'll see you tomorrow", I still didn't freak out on him when he was a no-show. But when Fro-Yo finally realized that he missed the appointment, he left me a long rambling message on my cell profusely apologizing, going on and on about how he confused the days of the week, yada yada yada. And then followed up with a gchat to let me know again that he was sorry. Of course I expected some sort of explanation for the no-show, cuz it was just really weird that I didn't see Fro-Yo considering he confirmed with me he was going to make it. BUT then today, two weeks later, Fro-Yo asks for my blog's URL and mentions how he's ready to read about the entry that details what nerve he had for not showing up and pretending he didn't know what day of the week it was. Isn't that crazy that my friends reacted that way? Am I really that scary?! I mean sure, I am judgemental, snobby and always call it like I see it. But that usually only applies to people other than my friends. Okay that's not true...sometimes I pass judgement on friends too. However I didn't know they knew that! I mean, I seriously thought my Berkeley girlfriends were kidding when they gave me the nickname "Cranky Angel"...you know, like it's ironic...like how sometimes a football player's nickname is Tiny? So now the bigger question that I have to answer for myself is, do I embrace the fact that people find me scary? I mean it's kind of cool to have that "Don't make the V-train angry or else" reputation. It makes me feel like I'm gangsta or something. Just last night I was telling Meddlesome about how a friend of a friend aggressively pursued a non-confrontational yet very successful wealthy older man, who also happens to be married. They've been dating a few years, him "promising" that he's going to leave his wife, at least that's what she thinks. Well, I'm sure you're thinking I know how this story ends. And maybe it'll end the way you think but for now, I'd say she's making out pretty well. So far she's gotten a house, car and $250K out of this mad love affair. Where am I going with this you ask? Well the interesting thing is the woman is cute but not drop-dead gorgeous. She's definitely no Amanda Peet. Her personality is not so captivating to me either. And yet she was able to snag this crazy sugar daddy. So Meddlesome naturally pondered why she never meets men like this? After all, she's attractive, financially independent, intelligent and totally has a guy's sense of humor (e.g. she loves movies like Jackass and can't get enough of Tucker Max). Who wouldn't want to date her? Well, I think I have a solution for Meddlesome and all the other ladies and gents looking for Millionaire Singles, a dating site for single millionaires, and men and women looking to meet them. Here's the thing though, I believe the intention of the website is good. There's no trickery to be had. The people are honest about their money expectations for a mate. But I think you're going to still have to do a lot of your own legwork in order to meet the right person among the "Date a Millionaire" members. Based on what I've seen, I'm gong to guess that most of the singles on the site are looking for the millionaires...but hey, if it weren't for this website and you aren't yourself a millionaire, how else would you meet a millionaire...especially a millionaire that's not married?! I mean, can it get any easier than this millionaire dating website? Meddlesome, I hope you give it a shot and leave insightful comments about your experience. I'm sure a lot of folks would be interested to hear about it! This post is sponsored by "Date a Millionaire". I had dinner with my ex-boss tonight at Senor Fred. The few chips that I had with the house salsa were delish. But since it's (as A likes to say) "crunch time," I had to refrain myself from eating the whole basket of chips. Man, I hate seeing free chips and salsa go to waste. But anyway, in an effort to cut out unnecessary calories, I only drank water while my ex-boss had like 10 margaritas. And as most of you know, it's really obvious that you're not drinking, if the person you're with is drinking. Surprisingly or maybe unsurprisingly, my ex-boss asks if I'm preggers. I'm thinking I may get this question a lot for the next 2 months leading up to my wedding. So let me set the record straight right now, just because I'm in my 30s, 98% of my friends are married with children, I'm not drinking alcohol and am always nauseous, that doesn't mean I'm pregnant!!!!! And if any of you ask me if I'm pregnant after reading this, I'm going to be uber offended because I'm going to assume that you are mistaking my fatness for a growing fetus in my belly. And it'll be even more offensive than usual because I've just stated above that I am dieting!!!! Another thing, just because I have stated that I am dieting, that doesn't give you the right to judge if you see me stuffing my face with a cupcake every now and then...even though I'm the most judgemental of us all! And yes, if you are sensing that I'm really cranky, it's because I am! After all, I've been dieting for the past 2 weeks which means I've been hungry for the past 2 weeks...you'd be cranky too! I think Matthew Lillard was at Senor Fred's tonight. But since I only saw him briefly, I decided it didn't warrant a separate "Star Sighting" post. Ever since my brief stint at Global Icons and meeting the Bmann, I have been intrigued by ethnic specific online dating sites. A & I got together before online dating became mainstream so I have never had the chance to try it. Although online dating is out for me, I still aim to go to a speed dating event one of these days. I'm hoping Meddlesome will ask me to go for moral support sometime but I think she's soured on the speed dating prospects. She said that there are a whole bunch of quality ladies and very few date-able guys at those events. It seems like online dating is really the way to go now, especially if you live in LA as it's so hard to meet people here. Anyway I totally digress. Getting back to Bmann, he was an avid user of the online Jewish Dating Service sites such as jsingles.com. I found it so interesting that not only are there Jewish men and women signed up for these sites, but sometimes also non-Jewish folks. I can't really identify why I thought it was so fascinating but what I do know is that Bmann was really happy with the women he met and seemed to go on lots of dates. I think it's because not only are you able to do searches for people that have your same interests, but you already have a baseline common interest in that you are both on a Jewish site which means that you have some sort of vested interest in the culture and/or religion. And it definitely beats the blind date or being set up by your parents, right? This post is sponsored by jsingles.com. I've decided since I live in LaLa Land, why not write about my surprisingly consistent celeb sightings? Well, they used to be way more regular when I lived in LA proper but now that I'm in surburbia, it's not as common. But don't fret, I'm as they say "in the business", so I still have a good dose of, if nothing else, B-celeb sightings. And I'm really only peripherally "in the business" but it's fun to say "in the business" because it's so obnoxious, isn't it? As some of you know, my life has been consumed by wedding planning. But I try not to really talk about it, unless it relates to something more interesting...like how Meddlesome and I saw Amanda Peet yesterday at La Conversation in BH. I was also fondly reminded that I was in a soooo LA kinda place when a very thin leggy blond and her thin kinda average looking male companion sat down behind us and she immediately said to the waiter, "He can't have carbs." Boy oh boy, and here Meddlesome and me not only were dipping our baguette in soup, but we had two humungous sandwiches on the way. I wonder what they thought of us. Anyway, Amanda Peet was super cute in her casual yet you know it was designer expensive "weekend garb" of white long-sleeved tee with magenta linen-like pants and of course, flip flops. And if you don't watch Studio 60 on the Sunset Strip, I'll mention for your benefit, that she's probably 7 months pregnant. But of course, she's all belly. Even with her belly, I think she's thinner than me. So Amanda and her hubby leave, Meddlesome and I stuff our faces with evil carbs and then walk across the street to B2V salon for my trial make-up application. If you're reading this Mihm or Wendy, yes that explains why I had crazy eye make-up on at 10am for Sunday morning breakfast at Le Pain. Did you notice my extra-long fake eyelashes too? I couldn't bear to wash off the make-up yet since I paid an arm & leg for it and didn't even go out to dinner sporting my ridiculous Hong-Kong actress face paint. I think the best part about the experience was witnessing the 40 year-old Jake Gyllenhaal hair stylist look-alike primping himself. For an hour, Meddlesome and I just sat their watching in puzzlement at wannabe Jake blow-drying his chin. It was the weirdest thing ever. So I finally had to ask the make-up artist what was up with that guy? Well apparently he's getting gray in his beard, so he applied some sort of coloring lotion on it but the color wasn't coming in fast enough for him so he was heat activating it with the blow-dryer. Who does that?!?! Anyway, keep tuned for more star sightings. I may retell some oldies but goodies. Seeing that it's just a few days away from V-day, I thought it was an apropos time to write about an eCard service. If you are like me, you probably have dabbled in sending eCards before and have probably received more than you sent. And what does that mean if you've received more than you sent: does it mean you are really popular or that you are really inconsiderate? Anyhow, I stopped sending eCards because I got tired of sending the same ones over and over again and didn't like the idea that it wasn't unique anymore. Because even though Hallmark or American Greetings had a gazillion free eCards to choose from, there really were only a handful that I deemed worthy of sending along. It's kind of like going to an actual Hallmark store. So I think Egreetings.com is really onto something. They do offer a selection of free eCards but most of their eCards are available via a subscription service. You can get a free 30-day trial membership to send unlimited eCards and if you like it, you can get a yearly subscription for $13.99. So basically you can be assured the eCards you are sending probably haven't been seen before and it's way cheaper than buying actual cards and mailing them out. Egreetings.com is known for having funny, risque, animated eCards for all occasions. All eCards on the site can be personalized with a message and pictures. Some of their current popular eCards include birthday eCards like "Birthday Cleavage" or the funny new Cupid pickup lines eCard "Cupid's Pickup Lines" or "ABC's of Valentine's Day" valentine cards. And when you do check out Egreetings.com, don't forget to send lil ole me an eCard! This post is sponsored by Egreetings.com. As anyone who I've spoken to in the last month knows, my stress level has been extremely high and is directly correlated to wedding planning. There's so much mama drama in my life, which I know is not unique for anyone who's planned a wedding. But it always feels like my family takes it to another level - can you say passive agressive? So my cousin, who I'll refer to now on as Meddlesome (I may explain how she got that nickname in a future post) tells me that my aunt, Nancy, told Meddlesome that my mom is mad at Meddlesome because Meddlesome is making all the wedding decisions and my mom feels left out. Of course my mom didn't tell me this and Meddlesome didn't hear this from my mom. And my family tends to be hyperbolic and gossipy which makes for pretty funny stories but can be really stressful if it applies to you. So knowing how my mom feels, some good friends recommend that a fabulous way to involve my mom, who I'll refer to as Lils. They say to narrow all my decisions to two good choices and let Lils make the final decision...that way, whatever she decides will be something I'm okay with. Genius, right? I tried this strategy with the wedding favors because seriously, who cares about the favors, right? I mean as long as the wedding favors has a big picture of Jemifus and me, who wouldn't be happy, right? Anyway, so Meddlesome and I come up with a few good authentic items from Vietnam that Lils can pick up on her trip next month. Like how personal and cool would that be, right? Well...when I gave Lils the options, I didn't anticpate that she would say, "Hmmmm...I'm not sure I like that idea. But if you're looking for something 'Vietnamese', I have a great idea. How about dolls?" So I say "Whuuuuut? Dolls?...I don't think I understand. I'm having a hard time visualizing? Did you say dolls?" Lils says "Yeah, dolls. 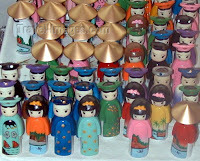 We could have dolls in traditional Vietnamese dress. We'll place the boy dolls on the place settings where the a man sits and the girl dolls where the woman sits." And so I say "Oh...well...I don't really think men like dolls" ...you know trying to be nice but firm that dolls probably aren't a good idea...but Lils says in her oh how silly of you voice "Of course they are not for playing, they are for display. People will take the set of dolls home and put them up in their house" Anyway I tried to get Lils off of the dolls but consider this a forewarning, in case you're expecting a porcelain swan filled with jordan almonds as a parting gift. Out of curiousity, I did a google search to see what "Vietnamese dolls" look like and they are growing on me. Whaddya think?